You may have seen these brightly colored cleansing devices (some are round and others oval shaped) and wonder what they do, and how do you use them. 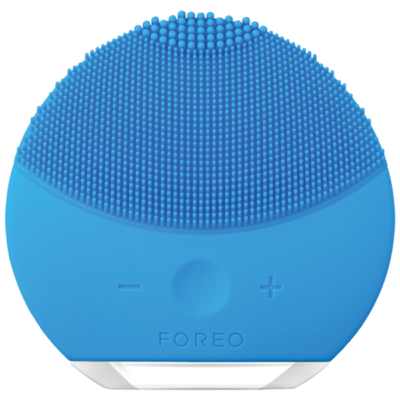 There are also quite a few FOREO models, so how do you figure out which to choose? The devices are designed to gently exfoliate the skin on a daily basis, and some models have an anti-aging channel that helps to stimulate specific areas of concern. FOREO is a Swedish based company, founded in 2013 when it launched the LUNA™ their silicone skincare cleansing device that uses T-sonic™ pulsations that cleanse the skin and have an anti-aging effect too. Since then other models have been added to the range, as well as versions for men. Choose from a rainbow of colors from aquamarine, fuchsia, midnight, mint, pearl pink, purple, or sunflower yellow. The wonderful thing about these cleansing devices is that you can use them with any cleanser (although it’s best to avoid clay based cleansers or ones with particles as they will be less effective), and FOREO also have their own day and night cleansers available that can be used with all devices. Wet the face and apply a cleanser, whether it is a lotion or a foaming cleanser. Cleansers with particles or clay based ones won’t work as well as they may get stuck in the silicone brush tips. The same goes for cleansing oils or balms, which will clog the bristles. Activate the LUNA and apply to the face and with small circular movements for a minute. I recommend starting on the cheek (under the eye), then move down to the chin, across the other cheek, across the forehead, then down to the nose, and above the lip area. Apply also to the neck in circular upward movements. Rinse off the excess cleanser, and dry the skin. Also rinse the LUNA and pat dry. For LUNA models with anti-aging mode, press the device on the areas of concern for up to a minute. It will take a few days before you get used to using the device, but once you do, you will feel the skin energized and with a slight tingling. Think of it as a workout for the skin. I definitely felt a difference after my first use, and my skin felt softer and smoother after a couple of uses. This is ideal for people who like facial massages but don’t like people touching their face, or those who don’t have time for facials. For those with dull skin, or a slow skin renewal cycle, using a FOREO device can help stimulate the skin gradually without having to use too many products. Ideally you should use it day and night, but if you choose to use it only in the evenings, it still has a wonderful effect. There are several models to choose from and all are rechargeable except for the play version, and some have the anti-aging mode, and other don’t. It’s best to look at what device suits your needs and lifestyle, and then decide on a color! Don’t forget a skin cell renewal cycle (when new skin cells come to the surface) is about 28 -35 days, so that’s when you will see the best results. LUNA™ go (£85/$99) ~ This device is available for several skin types; normal (pink), oily (turquoise), combination (blue), and sensitive (purple). This model has cleansing and anti-aging modes available, and is the same size as the play version. LUNA™ mini (£85/$99) ~ A slightly bigger version that is palm sized, available in magenta, cool grey, petal pink, purple, and turquoise blue, and is suitable for all skin types. LUNA™ mini 2 ( £119/$139) ~ This version has eight different customizations, and is suitable for all skin types. LUNA™ (£129/$169) ~ Available in different brush heads for combination, ultra sensitive, and sensitive to normal skins complete with anti-aging mode. LUNA™ 2 professional (£225/$249) ~ This is like having your own spa treatment that uses dual T-sonic technology. It is suitable for all skin types and has the anti-aging mode, and comes in three colors; aquamarine, pink and magenta. LUNA™ luxe (£5,100) ~ The ultimate version comes with a 18-karat gold or solid platinum bases, luxe gold for women, and luxe platinum for men, complete with the anti-age mode.